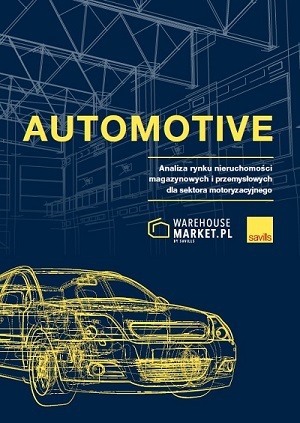 “The automotive industry is Poland’s second largest manufacturing sector while the warehouse and industrial property market is the country’s top commercial real estate sector posting the strongest growth in the last three years. The rapid expansion of the automotive industry and the fast growth of the logistics market are tightly knit together. The record performance of the warehouse market has been largely driven by e-commerce in addition to the automotive industry that has always been one of the cornerstones of Poland’s economy,” said Michał Śniadała, Associate Director, Industrial Agency, Savills. Nearly every tenth employee in the manufacturing industry works in the automotive sector, reveals real estate advisory firm Savills in its latest report Automotive: Analysis of the Warehouse and Industrial Market for the Automotive Sector. Report authors say that this sector comprises not only leading car manufacturers, but also a growing number of independent automotive parts and accessories producers. “In 2017, the number of passenger cars churned out in Poland nearly equalled the population of Poznań while the number of tyres manufactured for such vehicles was equivalent to the country’s entire adult population. This illustrates the proportions on this market which is being increasingly driven by suppliers of automotive parts and components delivered across Poland and overseas,” says Michał Śniadała, Savills. In 2006, motor vehicles accounted for nearly 60% of the automotive industry’s sold production compared to 40% generated by the automotive parts and accessories sector. These proportions reversed a decade later. According to the Central Statistical Office of Poland, in 2016, Poland sold PLN 77 billion worth of automotive parts and PLN 54 billion worth of motor vehicles. The Polish Investment and Trade Agency’s data shows that Poland has approximately 900 automotive parts manufacturers employing nearly 150,000 people. The largest EU market for Poland-based manufacturers is Germany (a 42% share). In the last ten years, vehicles production rose at an average of 3% annually compared with the average annual growth of 11% posted by the automotive parts and accessories manufacturing sector. “Approximately 640,000 automotive parts are delivered daily to car garages and stores across Poland. A new car is made up of 80% of parts supplied by independent manufacturers, while the remaining 20% comes directly from car manufacturers. This market structure, given its growth dynamics, calls for an appropriate logistics base and continued investment in logistics facilities,” said Alfred Franke, President of the Association of Automotive Parts Distributors and Manufacturers (SDCM), partner of Savills report. According to MotoFocus’ survey, 75% of automotive parts manufacturers intend to expand their manufacturing, warehouse or office space in 2018-2019. However, survey respondents also cited Poland’s unclear and uncertain legal and tax environment, and lengthy administrative procedures for development projects as two key barriers hampering further growth. Poland-made car brands include Opel (Opel Manufacturing Poland in Gliwice), Fiat (Fiat Chrysler Automobiles in Tychy) and Volkswagen (VW plants in Września and Poznań). Poland is also home to such leading global suppliers of automotive parts as Brembo, Delphi, Valeo, Federal-Mogul, Mahle and ZF TRW, as well as many Polish manufacturers, including Wuzetem, Asmet and Lumag. Market operators also include automotive parts wholesalers such as ILS, which is responsible for the logistics for Inter Cars, Poland’s leading distributor of car components. The Association of Automotive Parts Distributors and Manufacturers (SDCM) estimates that leading automotive parts distributors occupy a total of 660,000 sq m of space in Poland’s core warehouse facilities; this is an equivalent of more than five times the combined floor area of the Palace of Culture and Science in Warsaw. According to Savills data, in 2017 the Polish automotive industry leased 211,000 sq m of warehouse and industrial space, which is roughly the size of 30 football pitches combined. Regions targeted included Upper Silesia, Poznań, and Western Poland, an emerging warehouse hub close to Poland’s western border. Last year’s biggest lease transaction was BMW’s 32,000 sq m BTS warehouse scheme developed in Swiecko by Goodman. “The automotive industry’s direct share of net warehouse and industrial take-up has ranged between several and up to twenty per cent in recent years. The last three years saw an increase in this sector’s leasing volumes. The automotive industry, however, plays a much bigger role on the warehouse market than official statistics show. Demand for warehouse space also comes from supply chain operators in the automotive industry, including logistics operators such as Ceva and Sistema, and retailers, including electronics, such as AB Pierce and Oponeo.pl. What’s more, modern warehouse and industrial space leasing market is only part of all properties used by the automotive sector. Many warehouses and plants are located within owner-occupied facilities or older-type buildings,” said Wioleta Wojtczak, Head of Research at Savills. The Polish automotive industry is at the threshold of Industry 4.0, a revolution combining the realm of new technology with the realm of devices and machines to enable fast production of short series, to streamline manufacturing and reduce costs. Automation is also a response to labour shortages. Savills predicts that within the automotive sector production methods will soon change drastically with the onset of a more widespread use of automated guided vehicles (AGVs). This will result in the end of fixed production lines. Such vehicles will bring components to a static work station. Increased racking automation is likely to create a need for taller warehouse units. There could also be potential for an evolution of the real estate leasing model and rents calculated in the cube rather than floor area. “Approximately 75% of automotive parts manufacturers plan to invest in real estate in 2018 or 2019. Demand for warehouse space is expected to come not only from newcomers to Poland and tenants expanding, but also from firms moving to modern Class A warehouse buildings. This will be underpinned by the desire to implement new technologies, increasingly required to be able to compete on the automotive market that has always been at the forefront of innovation. Going forward, car and automotive parts manufacturers are also likely to benefit from new special economic zone regulations which, if effected, will apply to the whole territory of Poland and introduce exemptions for large employers,” said Michał Śniadała, Savills.